Porsche's updated Cayman sports car has many safety features, including six airbags as standard, with TRW Automotive Inc. providing the driver airbag module and Autoliv Inc. supplying the passenger and side airbags. Brembo S.p.A of Italy supplies the brakes for the Porsche Cayman S variant, as it also does for the 911 Carrera. The brakes comprise four-piston aluminum monobloc fixed calipers with inner-vented brake discs. Porsche offers an optional dual-clutch transmission from ZF Friedrichshafen AG on the Cayman. The seven-speed gearbox helps improve the Cayman's fuel economy by approximately 10 percent to 31 mpg (7.6 liters per 100km) compared with earlier versions of the car equipped with the Tiptronic S automatic transmission. Fuel economy in the more-powerful Cayman S improves 15 percent to 30.1 mpg (7.8 liters per 100km). Another important advantage of the ZF dual-clutch transmission is that the gears are already "in mesh" when shifting, which prevents power loss and speeds up the gear-change process by 60 percent. ZF makes the dual-clutch transmission at its plant in Brandenburg, near Berlin. ZF also produces transmissions for the Porsche Panamera, Boxster and 911 at that location. The dual-clutch transmission option costs 2,945.25 euros in the German market. Porsche launched the updated Cayman at the 2008 Los Angeles auto show. The refreshed roadster arrives with newly developed more-powerful boxer engines. The engine on the Cayman provides 265hp, an increase of 20hp compared with earlier versions of the car. Power in the Cayman S has been increased 25hp to 320hp. 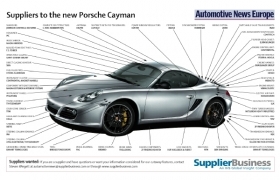 The Cayman's base price in German is 50,314 euros ($61,460). The Cayman S starts at 61,976 euros. Porsche assembles the Cayman in Uusikaupunki, Finland.